While plastic straws and disposable cutlery potentially lead to environmental damage, a company that offers an alternative in the form of plastic made from the avocado seed is the center of attention. Since 2012, the Mexican company, Michoacán-based Biofase is manufacturing biodegradable cutlery and straws made out avocado seeds. Scott Munguía was a chemical engineering student who got an idea to solve pollution issues with the help of a reliable source for biodegradable plastic. He tested the qualities of raw materials like mango and mamey sapote seeds, and he came across a paper that had a picture of the corn molecule used to make bioplastic. Munguía said that he already knew what the avocado seed molecule looked like. So, the idea was born, and after two years of developing it, he now has a team of 14 employees working in a plant with a capacity of 700 tons a month. Bioplastic News reports that Mexico produces 300,000 pounds of avocados, or half of the world’s supply, while the global market for bioplastic is $5.8 billion. On the other hand, avocado seeds pile up in Mexico in huge amounts and usually end up being burned at landfill sites in Mexico. Munguía spent a year and a half to find an effective technique to extract a molecular compound from the avocado pit and obtain a biopolymer, which could be afterward molded into any desirable shape. Munguía patented his process by 2013 and founded Biofase, and after two years, he installed his first plant in Morelia. It manufactures 100% biodegradable eco-friendly plastic resins and sells them as raw material. In 2016, the second plant was installed, where Munguía started manufacturing his own bioplastic-based products, like plastic cutlery, and straws. 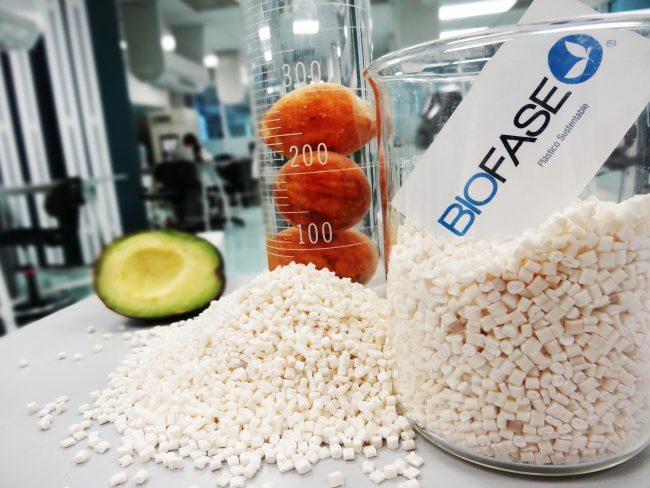 Biofase have been using tons of avocado pits daily to produce straws and cutlery, sourcing its material from avocado processors to make the first products made from fully renewable and sustainable sources” instead of the fossil-fuel-based polymers that comprise common plastics. The technology is believed to be able to meet the demands of governments and consumer markets straining under the pressures of uncontrollable plastic waste, much of which comes from single-use goods, and stimulate toward to turn to more sustainable business models. The company website reveals two types of its “Avoplast” products, the one done from 70 percent vegetable matter, and a patented blend which is 100 percent based on avocado seed biopolymers and other biodegradable elements. Such products lead to a faster and easier disposal of products, while it is estimated that plastic straws need at least a couple centuries to decompose. On the other hand, these bioplastic products biodegrade after 240 days of being exposed to the elements or buried in the ground. The monthly yield of these products is 130 tones, 40% of which are straws, and 80% of the production is exported to the United States, Costa Rica, Canada, Colombia, and Perú. The daily need of avocado seeds is 15 tones, which are provided from the United States-based food company Simplot, which also operates a plant in Mochoacán. The second biggest market for Munguía’s company is Mexico, and its principal customers are chain restaurants like P. F. Chang’s China Bistro, Fiesta Americana, and Chili’s Grill & Bar. While the production is on the rise, the company founder, Scott Munguia, admits that most consumers are still not comfortable with the idea of buying avocado-based plastics, and are still reluctant to pay more for a product that protects the environment. Yet, we all hope that this will change very soon, and consumers and corporations will be willing to shell out a little more money, and choose sustainable, environmentally friendly options. Cinnamon And Honey: The Possible Treatment For Many Diseases?